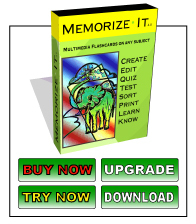 Over the weekend I used Memorize-It in a new and unique way. On our Africa trip we worked at a boarding school (Bridges Academy) for students from the townships we have adopted. It's hard to learn the names of thirty kids and I was still struggling with a few people after our two weeks were up. We are now helping train the team for the December trip. Since I had a bunch of pictures of all the students I created flashcards for the next team so they can have a head start in learning the names. I put the picture of the student on the front of the card and their name on the back. It was actually helpful for me as well as it helped me refresh my memory of a few of the student's names. Very cool.